What are the effects of temperature on handling forces? As discussed in “Technical Guide – Edition 1: Gas Spring Overview”, temperature not only affects the output force of the gas spring, but also the handling forces. The following graphs show how a spring behaves on an application at 20°C and then again at 65°C. 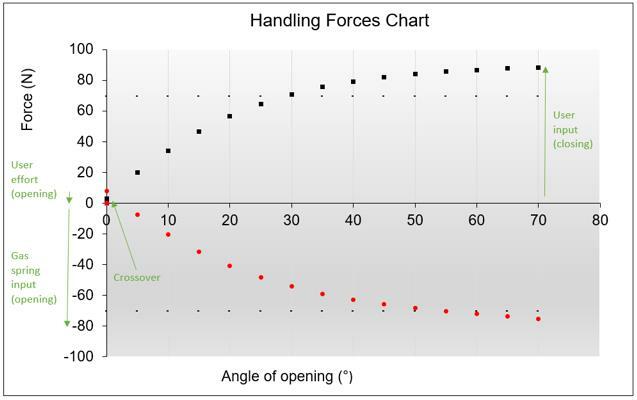 As is seen in figure fourteen, at 20°C crossover occurs at an opening angle of around 7°, with the handling forces being acceptable in both opening and closing. However, when the ambient temperature increases to 65°C (for example, in the case of an engine cover application), lift will occur almost instantaneously. This behaviour is unpredictable to the operator, in some cases proving dangerous. It is also evident that handling effort to close the application increases. For these reasons it is important that understanding of what the ambient and ‘normal’ operating temperatures of an application will be, so if necessary, a suitable compromise can be made in handling performance. Comments will be moderated before being published. Eureka Knowledge brings together a unique blend of application stories, helpful whitepapers, instructional videos and insightful blogs for the UK’s design engineers. If you feel you have content that would be relevant to Eureka Knowledge feel free to contact us.